ladajo wrote: Typical Brown bias. The article demonstrates some leaps of logic, and a lot of naivety regarding what is currently going on in space as well. Meh. I think two things are going to drive the future of humanity, and they are interrelated in a big way: The coming (I hope) Energy Age, and its enablement of real human space access, The Interplanetary Age. Man you guys are a tough crowd...here I post a vaulting optimistic pro-space pro-USA future hope and you just pick it apart. Like most things people do the emotional motivations are just as important (maybe more so) than the logical/practical at least initially. Okay; in the long term the development of let us say fusion drives would be needed to really open up the solar system and insure an adequate long term resource/energy base for the human races' long term "survival with style"; paraphrasing the late J.E. Pournelle--agreed. But we have to get there from here and reusable BFR developed by an apparently hyper-competent entrepreneur (Musk) in competition with another such (Bezos) who both seem to have a strong desire for space development. Earlier efforts from decades ago by the likes of say Gary Hudson didn't have the bucks to back them up, Bezos is now the richest man on the planet and is prepared to spend "a billion dollars a year" or some such. Combine that with a big new military push into space (Space force/SDI) by the US government (believe Musk has already indicated his support for such) looks to me to be just the recipe we need. As an aside any comments about DARPA looking into EmDrive? A million bucks to start with and I am sure many more if it works out; I like the emphasis on orbit tending for (spy) satellites as the first application if it works out. DARPA has allot more money/clout to make things happen than NASA (Sonny White) has. Last edited by williatw on Sat Nov 10, 2018 12:25 am, edited 2 times in total. paperburn1 wrote: I have to agree wholeheartedly. Our next big step needs to be the availability of cheap dependable energy for the long-term. We can go back to our historical record and find civilization after civilization basically collapsed because the lack of available energy to overcome flood, famine, climate change or invader. Somehow by luck or my personal opinion the introduction of caffeine along with the cheap easily accessible petroleum stocks we were able to enter into the Industrial Revolution and develop precision and repeatability. If we develop fusion power (Polywell or some such) we would have both; power for domestic (Earth) usage and then access to easily the three orders of magnitude greater energy/material resources of the solar system at large. As for your argument about larger gravity wells that only makes sense if I assume they (the hypothetical aliens) never developed anything beyond chemical rockets at least for their launch systems. Surely at some point someone would invent a high thrust/energy to weight ratio nuclear drive of some sort. Hard to believe that hurdle explains the "Fermi Paradox"; I would guess some other kind of "Great Filter" that prevents intelligent technological species from occurring in the first place or causing them to not survive long afterwards for some reason. Last edited by williatw on Sat Nov 10, 2018 3:49 am, edited 1 time in total. The distance from L4 or L5 to the moon tends to defeat the purpose of using a separate spacecraft between LEO and near-lunar space. With a change of ships in lunar orbit or L1,L2 you can have one ship with larger accommodations or higher delta_V from LEO to near-lunar space, and another ship with lighter cabins or higher acceleration capability for surface operations. Last edited by paperburn1 on Sat Nov 10, 2018 12:39 pm, edited 1 time in total. As for your argument about larger gravity wells that only makes sense if I assume they (the hypothetical aliens) never developed anything beyond chemical rockets at least for their launch systems. Surely at some point someone would invent a high thrust/energy to weight ratio nuclear drive of some sort. Hard to believe that hurdle explains the "Fermi Paradox"; I would guess some other kind of "Great Filter" that prevents intelligent technological species from occurring in the first place or causing them to not survive long afterwards for some reason. Your right, I did make the assumption that "this is too hard lets do something else" We as a species have already started down this path. We no longer have the capability of the heady days of Apollo. Entire space shuttle complex is shut down . The space station is in danger of being shut down as well because we don't have the same capability we had before. The entire ISS could been launched on five Apollo missions but instead through poor planning?/? We chose to go the route of the space shuttle and lost a large amount of capability.It took almost 100 launches of the space shuttle to complete the ISS. Until the advent of Elon's must space X Corporation we were doing a slow and steady slide into space exploration being a tiny niche Operation of government and a few scientists.A lightweight fusion reactor like the Polywell would definitely be a boon and a game changer but I can see a people after losing their space capability no longer being able to get the Ambition to return to space because once again space is hard.Maybe that is the quote great filter quote is limiting people to being interplanetary explorers or more importantly interstellar explorers . Because something surely is and we need to figure out what it is to be prepared to be a space faring nation. About a week after Mars InSight touched down on Mars, another NASA space probe, OSIRIS-REx, arrived in orbit around an asteroid headed toward Earth called Bennu. The probe will spend the next two years mapping and examining Bennu. OSIRIS-REx’s mission will not only offer insights into the origin and evolution of the solar system — but also may interest future asteroid miners. One estimate suggests that Bennu contains $670 billion worth of material. The climax of the probe's stay around the asteroid will feature the extension of a sample-gathering arm that will take about 60 grams of particulate material from Bennu’s surface. The probe will blast out of orbit around the asteroid and bring its priceless cargo back to Earth. Center in Houston, Texas for study. One goal of the OSIRIS-REx mission will be to study the material from the carbonaceous asteroid, containing clays, some organic material, and volatiles (nitrogen, water, carbon dioxide, ammonia, hydrogen, methane and sulfur dioxide.) Key information for both planetary science and possible future mining projects. The second main science mission will study how the so-called Yarkoysky effect determines Bennu’s path in orbit around the sun. The effect involves the absorption of radiation from the Sun and its subsequent emission as heat, creating a tiny but measurable amount of thrust. A measurement of the Yarkoysky effect will be vitally important to future generations. Scientists believe there is a significant chance that Bennu could impact the Earth sometime in the 22nd century. The impact, were it to happen, would not be the world-killing catastrophe of the asteroid that destroyed the dinosaurs 65 million years ago — but it would hit with 1,200 megatons of force, creating massive devastation. OSIRIS-REx’s studies will refine understanding of the forces affecting Earth-approaching asteroids, thus aiding the defense against Earth impactors. So far, missions to other asteroids have not returned a lot of gorgeous images. An asteroid up close looks like a rock with various shades of gray. The images cannot compete with the alien landscapes of Mars, the glorious rings of Saturn, or even the “magnificent desolation” of the lunar surface. However, from both a scientific and commercial perspective, NASA’s voyages of discovery like OSIRIS-REx have an importance that is beyond evaluation. Asteroid science will help humankind gain a better understanding of the little part of the universe where our home planet orbits the typical, commonplace star that we called the sun. The knowledge won by such missions is as valuable, in its own way, as the gold sought by the Conquistadors in the last age of exploration. Science illuminates our civilization, making it better, opening paths to improve the human condition. If we have the will to acquire them, the resources that asteroids consist of can become the basis of a new, space-based industrial revolution, creating an abundance of wealth that could vanquish poverty and want. Undertakings like OSIRIS-REx are not only a sign of American greatness, but evidence of what human beings can accomplish when they set out to do great and difficult things. What is supposed to happen here? D Day is decades not years away. Talk about thread drift. I just went back and looked, there were a couple of posts about financing with the bank idea, but none of the rest directly addresses the idea of colony mutual funds and such for financing individual or group colonization. Over the past few years, SpaceX has become one of the most active launch companies on the planet. In 2018 alone, SpaceX performed 20 launches (as of press time), with two more scheduled before the end of the year, representing about 20 percent of roughly 100 worldwide launches. The company stands out in another way—it’s the only one to recover and reuse its rockets. Landings of its Falcon 9 first stages have gone from being novelties, often with explosive failures, to a routine aspect of most missions. Last May, SpaceX introduced its latest version of the Falcon 9, called the Block 5, the first stage of which is designed to be flown 10 or more times. Although the Falcon 9 will be SpaceX’s workhorse for years to come, the company added a new vehicle to its stable three months before introducing the Block 5. Last February, the company launched the first Falcon Heavy, which includes three Falcon 9 first stages lined up in a row. The Falcon Heavy is capable of placing more than 60 metric tons into low Earth orbit, far more than any existing launch vehicle can accomplish. But even the Falcon Heavy pales in comparison with what SpaceX is now developing, a vehicle that until recently was called the Big Falcon Rocket, or BFR. (The R-rated interpretation of that acronym wasn’t lost on the rocket’s developers, who initially used it as the informal code name for the project.) In late November, Musk announced a name change for the BFR—to Starship for the crewed upper stage, and Super Heavy for the lower booster stage. 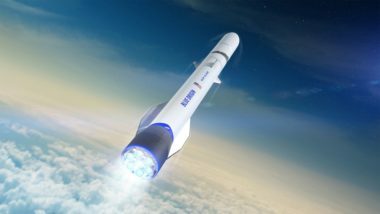 That booster will have 31 of the company’s Raptor engines, which are under development, while Starship will be outfitted with seven Raptor engines. Both stages are intended to be reusable, and Starship will be able to carry dozens of people to destinations far beyond Earth orbit. SpaceX has modified the design of this colossal vehicle a couple of times since conceiving it in 2016. The most recent version was described at a press conference this past September at the company’s California headquarters. This version, Musk said, would be able to place 100 metric tons on the surface of Mars, provided that the spaceship’s upper stage was refueled in Earth orbit before departing for the Red Planet. Speaking in early September at an event to celebrate the 60th anniversary of the Defense Advanced Research Projects Agency, SpaceX’s chief operating officer, Gwynne Shotwell, said that the company will begin making the first “hop tests” of the BFR’s upper stage (Starship) in late 2019. Blue Origin, by contrast, has yet to launch anything at all into orbit. But the company has similarly big ambitions. It’s working on a rocket it calls New Glenn (named after John Glenn, the first American to orbit Earth), which is scheduled to launch for the first time in 2021. The two-stage rocket will be able to place 45 metric tons into low Earth orbit, with its first stage designed to land on a ship at sea and be reused up to 25 times. “We’re in build mode right now,” said Bob Smith, CEO of Blue Origin, during a space policy workshop in Washington, D.C., this past October. The company has completed a new 70,000-square-meter (750,000-square-foot) factory for constructing the rocket just outside the gates of the Kennedy Space Center, in Florida, and it’s currently building a testing and refurbishment facility nearby, which is expected to be completed in early 2019. Blue Origin is also modifying a dormant launchpad at nearby Cape Canaveral for its operations and has signed up several commercial customers for New Glenn. Up and Away: Blue Origin’s New Glenn rocket [top] will be capable of lifting 45 metric tons into low Earth orbit, while SpaceX’s Starship [bottom], if refueled in space, will be capable of ferrying 100 metric tons to the surface of Mars. Powering New Glenn will be an engine that Blue Origin has been developing called the BE-4. The company is also selling the engine to United Launch Alliance (ULA), a joint venture of Lockheed Martin and Boeing that was formed in 2006 to serve U.S. government customers. ULA will use the BE-4 on the first stage of its Vulcan rocket, a successor to its existing Atlas and Delta vehicles. Last October, both Blue Origin and ULA received contracts from the U.S. Air Force to support development of their launch vehicles: $500 million for Blue Origin and nearly $1 billion for ULA. (SpaceX did not receive an award as part of this Air Force Launch Service Agreement program, although the company did not disclose whether it had even submitted a bid.) “It’s exciting to see that we’ll be powering two launch vehicles in the United States Air Force’s arsenal for decades to come,” Smith said at that workshop. New Glenn builds on the lessons Blue Origin has learned with its suborbital tourist vehicle, New Shepard, named after Alan Shepard, whose 1961 suborbital trip made him the first American in space. New Shepard, featuring a reusable booster and capsule, is being tested at Blue Origin’s West Texas launch site. Unlike Blue Origin, SpaceX has no apparent interest in suborbital spaceflight and is focusing instead on sending people into orbit, most immediately using the Block 5 version of its Falcon 9 booster. SpaceX and Boeing both have NASA contracts to develop crewed spacecraft to transport astronauts to and from the International Space Station. Development of SpaceX’s Crew Dragon, a variation of the Dragon spacecraft currently used for carrying cargo to the space station, is nearing completion. NASA released a schedule last October that calls for a final test flight of the Crew Dragon, with people aboard it for the first time, this coming June. Musk has long talked about his desire to make humanity “multiplanetary” and thus not vulnerable to a calamity, natural or human-made, affecting Earth. We should try “to become a multiplanet civilization...to ultimately have life on Mars, the moon, maybe Venus, the moons of Jupiter, throughout the solar system,” he said at the September press conference where he described the most recent version of the BFR. Yet Musk has shown an increasing interest in missions to other destinations, particularly the moon. 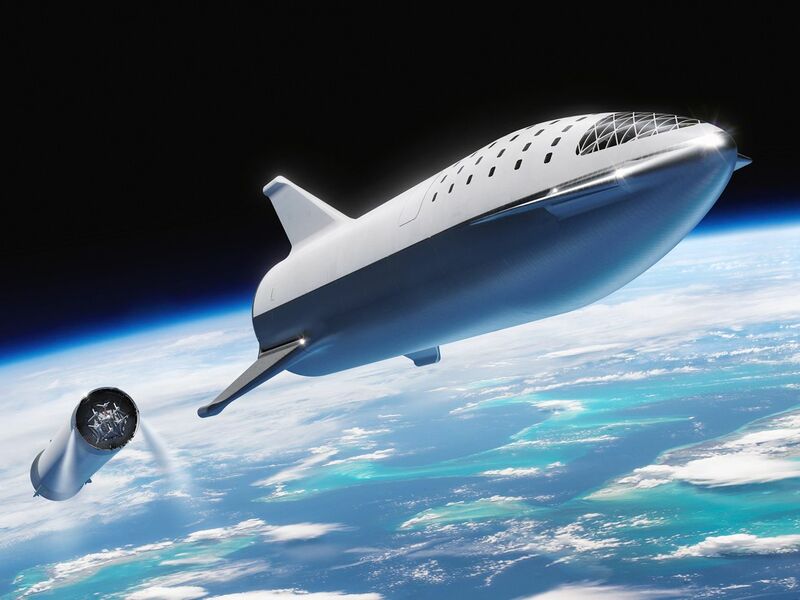 At the September press conference, he announced that Japanese billionaire Yusaku Maezawa had paid for a BFR flight, scheduled for 2023, that will go around the moon. Maezawa, an art enthusiast who made his fortune in online fashion retailing, plans to fly on that mission accompanied by a small number of personally selected artists. Musk has also suggested that the BFR could support permanent stations on the moon. “We should have a lunar base by now,” he said in that 2017 speech, but he hasn’t disclosed any details about who would build it, or how. Blue Origin has a similar view of humanity’s destiny. “Blue Origin believes in a future where millions of people are living and working in space,” the company states on its website. Bezos, a Princeton University alumnus, said he was inspired by Gerard O’Neill, a Princeton physicist who in the 1970s proposed the development of giant space settlements that could be home to thousands of people. Those financial assets are in the form of his stake in Amazon.com, which makes him the wealthiest man alive, worth more than $100 billion. He said he spends about $1 billion a year on Blue Origin and suggested at the Wired 25 conference last October that his outlays for the company may go up in 2019. “Blue Origin is the most important thing I’m working on,” Bezos said, “but I won’t live to see it all rolled out.” Musk, too, speaking about colonizing Mars, has said, “I probably won’t live long enough to see it become self-sustaining.” Clearly, these titans of today’s gilded age are thinking hard about their legacies, which despite their many other accomplishments may end up being for what they do in space. This article originally appeared in the Feb. 25, 2019 issue of SpaceNews magazine. Jeff Bezos is not a man of little dreams. 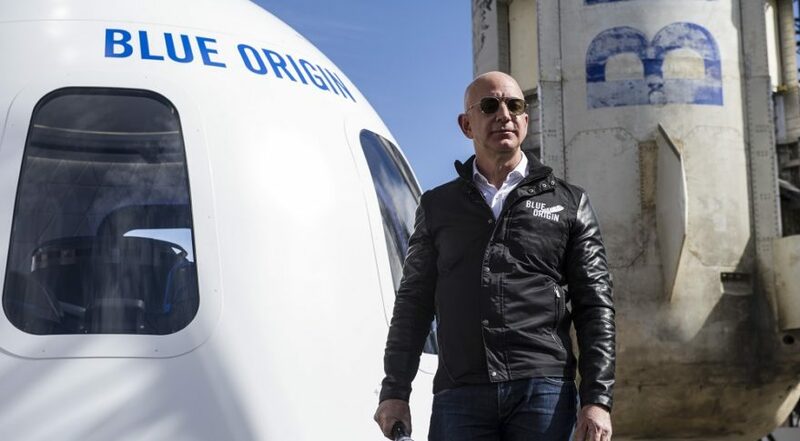 The world’s richest person, with an estimated net worth of more than $130 billion, is spending some of his wealth on his space startup, Blue Origin. 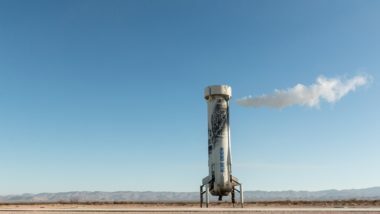 Much of the attention that the company has received has focused on the billions he’s invested into the company, its plans to fly tourists on its suborbital New Shepard vehicle and its entry into the orbital launch market with its New Glenn rocket. But those vehicles are just the start of a much grander vision about the future of humanity. Speaking to an audience primarily of aviation industry executives at a Wings Club luncheon in New York Feb. 20, Bezos made the case those vehicles are the first step toward a future where humanity expands beyond Earth to harness the energy and other resources of the solar system. That very long term future includes up to a trillion — yes, a trillion — people living in places like the space colonies proposed in the 1970s by Gerard K. O’Neill. The alternative, according to Bezos? A life of “stasis” on the Earth, rationing the limited resources available on our home world. Bezos acknowledges he doesn’t know all the steps that it takes to achieve that vision, but he does know the first one: developing low-cost and routine access to space with reusable launch vehicles. That capability, he argues, can create the infrastructure to enable “dynamic entrepreneurialism” in space, in much the same way Bezos, nearly a quarter-century ago, was able to build upon the terrestrial infrastructure of finance, transportation and the internet to create Amazon, the company whose success is fueling his space vision. Bezos outlined that vision in an onstage interview at the Wings Club event with SpaceNews senior staff writer Jeff Foust. That interview, in condensed form here, started with comparisons between spaceflight today and the early aviation industry. The aviation industry is a mature industry, but it’s grown that way over the course of more than a century. Commercial spaceflight is still a long way from that goal. We’re still in the barnstorming phase. Where do you see some of the parallels between the growth of aviation and the growth of commercial space, and what role will Blue Origin play in that? I really do think we’re at the barnstorming phase. It’s an interesting analog to early aviation because in a lot of industries, new technologies are first used for entertainment. It’s happened over and over again across industries and, of course, barnstorming was one of the first commercial things that small aircraft could do a long time ago. One of the things that I’m very excited about with New Shepard, which is our suborbital tourism vehicle, is using that to get a lot of practice. One of the equilibria that we’re at today with space launch is that we don’t get to practice enough. The most flown vehicles may fly a couple dozen times a year launching payloads into orbit. Anything you do just a couple dozen times a year, you never get really good at it. So, we need to be going into space very frequently, in a very routine way. One of the reasons that aviation is so safe today is that we do have so much practice. If your payloads cost hundreds of millions of dollars, they actually cost more than the launch. It puts a lot of pressure on the launch vehicle not to change, to be very stable. Reliability becomes much more important than the cost. It’s hard to get off of that equilibrium. It actually drives you in the wrong directions, where you have fewer launches of very expensive satellites. And that’s what you see happening in many cases. What we want to do at Blue Origin is to try to get on that practice curve, and to do that we have to have an operable, reusable vehicle. And the key point there is really operability. The space shuttle was reusable in only the most pedantic of senses. In reality, they would bring the space shuttle back, inspect it in very elaborate ways and then re-fly it. It was literally better to have an expendable vehicle. You asked what’s Blue Origin’s role in this. We want to drive down the cost using reusability. And the vision is to figure out how there can really be dynamic entrepreneurialism in space. I’ve witnessed this incredible thing happen on the internet over the last two decades. I started Amazon in my garage 24 years ago and drove all the packages to the post office myself. Today we have 600,000-plus people, millions and millions of customers, a very large company. How did that happen in such a short period of time? It happened because we didn’t have to do any of the heavy lifting. All the heavy-lifting infrastructure was already in place for Amazon. There was already a telecommunications network, which became the backbone of the internet. There was already a payments system, called the credit card. There was already a transportation network, called the U.S. Postal Service and Royal Mail and Deutsche Post, all over the world, to deliver our packages. We didn’t have to build any of that heavy infrastructure. An even more stark example is Facebook. Here is a guy, Mark Zuckerberg, who started a company in his dorm room, which is now worth half a trillion dollars, less than two decades ago. So how do you get that kind of entrepreneurial dynamism in space? You need to lower the price of admission. Right now, to do anything interesting in space, the entry price point is hundreds of millions of dollars. Nobody’s going to do that in their dorm room. You can’t have the Mark Zuckerberg of space today. It’s impossible. Two kids in their dorm room can’t start anything important in space today. That’s why I want to take the assets I have from Amazon and translate that into the heavy-lifting infrastructure that will allow the next generation to have dynamic entrepreneurialism in space, to build that transportation network. That’s what’s going on. That’s what Blue Origin’s mission is. If we can do that, the whole thing will take off, and there will be thousands of companies doing creative things in space. By the way, about getting into orbit, it turns out there’s not many creative ways to do that. Once you get into space, you can really unleash a lot of creativity, but the launch itself? I have been through all of the creative ways and, believe me, chemical rockets are the best. You just can’t throw them away after every flight. New Glenn lifts off with almost 3.9 million pounds of thrust and uses liquid natural gas and liquid oxygen as its propellants. The propellants to fuel New Glenn cost less than a million dollars. It is not the cost of the fuel. 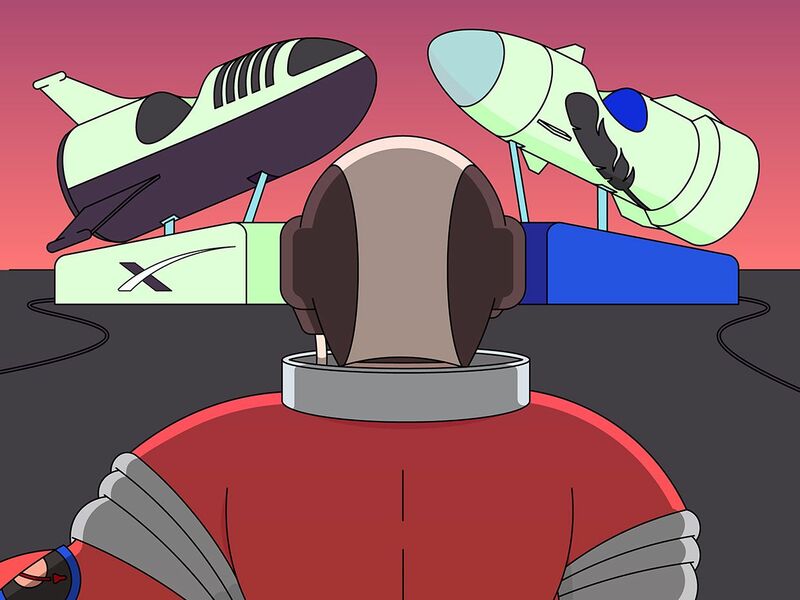 It’s taking all of that high-grade aerospace hardware and throwing it away. And you have to design for operability up front, so that’s one of the other reasons that we did New Shepard first. We’re taking all of the lessons that we have from New Shepard and incorporating them into New Glenn. And the reason we chose vertical landing as our recovery architecture is that vertical landing scales really well. In fact, the bigger the vehicle gets, the easier it is to land because it’s the inverted pendulum problem. New Shepard is the hardest vehicle to land that we’ll ever have to land. The goal is to start flying people on New Shepard this year? How is the test program going? It’s going really well. We have tested our escape system very successfully. We’ve tested high altitude escape, pad escape, maximum aerodynamic pressure escape. We’ve tested all of the envelope there for escape. It’s one of the most complicated things that we’ve done. And the booster is performing very well. We now have two boosters there in Texas for the first time. The reusability of it is working very well. So, we’re in very good shape. I do keep reminding the team — I’m relentless on this — that it’s not a race. I want to fly humans this year, but we’ll fly when we’re ready. What’s the importance of New Shepard to your future plans? The strategic objective of New Shepard is to practice, and a lot of the subcomponents of New Shepard actually get directly reused on the second stage of New Glenn. New Glenn is powered by two vacuum variants of the BE-3 liquid hydrogen engine, which is the same engine that we fly, with a truncated nozzle, on the New Shepard propulsion module. All of those systems will get a tremendous amount of practice with that suborbital mission and will be carried over directly to the upper stage. And then the lessons learned on things like landing, operability and reusability, all of those things from the New Shepard program, those also get incorporated into the New Glenn booster. What do you think about New Shepard in terms of the competitive landscape? There’s Virgin Galactic and their SpaceShipTwo. Do you think about how you will compare in the marketplace? Yes, I do. One of the issues that Virgin Galactic will have to address eventually is that they are not flying above the Karman line, not yet. The vehicle isn’t quite capable. So, for most of the world, the edge of space is defined as 100 kilometers, but in the U.S. it’s different. [U.S. government agencies award astronaut wings at an altitude of 50 miles.] But I think one of the things they will have to figure out is how to get above the Karman line. We fly to 106 kilometers. We’ve always had as our mission that we always wanted to fly above the Karman line because we didn’t want there to be any asterisks next to your name about whether you’re an astronaut or not. And so that’s something they’re going to have to address in my opinion, before they’ll be better. So, if you’re flying on New Shepard you’ll definitely be above that 100-kilometer mark? You mentioned that New Shepard is the steppingstone to your orbital ambitions. You’re working on the New Glenn orbital launch vehicle and the building block of that is the BE-4 engine. How is the BE-4 coming along? That’s going really well. We’ve tested that engine, and it now has 1,800 seconds of test time on it. It’s been up to 400,000 pounds of thrust. The full thrust of the engine is 550,000 pounds of thrust. It’s liquefied natural gas fuel, liquid oxygen as oxidizer. It uses an oxygen-rich staged-combustion cycle. It’s a very advanced engine. We want it to be a 21st century American engine, the new version of the [Saturn 5’s] F-1. Are you approaching the end of the testing campaign for the BE-4? Well, there’s still going to be a lot of testing. Development has to be finished, qualification, then qualification testing will have to happen. But yes. Besides developing the BE-4 for your own New Glenn, you’re selling it to United Launch Alliance. What’s that relationship like, being both a vendor to a company but also a competitor? Pretty normal. In this industry, there’s a lot of cases of being a competitor in one way, but you’re often a customer and a vendor in another way. It’s not atypical in aerospace. Actually, it’s not that atypical in a lot of industries. No qualms on either side? No. After doing a very competitive process, they bid us very aggressively against Aerojet Rocketdyne as their other possibility for acquiring engines for the Vulcan vehicle. After that very aggressive process, they chose our engine. We’re very grateful for that, and we’re going to bust our butts to make a great engine for them. And by working with them, do you get benefits like economies of scale? Absolutely. With the amount of fixed expense that goes into developing something like the BE-4 engine, you want it to be used as much as possible. You want to amortize that fixed development cost across as many programs as you can. And what’s the status of New Glenn, both the launch vehicle and the launch site? All of those things are under construction. When it’s all said and done, we will have invested about a billion dollars into the manufacturing facility and the launch facility at Cape Canaveral. We also got a $500 million contract from the Air Force, the Launch Service Agreement award. That’s going to help us build launch facilities, for example, in Vandenberg. What’s been the customer reaction to New Glenn? You’ve already signed up some customers. Yes. Most recently, Telesat. We’re building a backlog for that vehicle right now. The industry is very hungry for additional launch providers. However, by the time New Glenn comes to market in 2021, there will be a lot of competition from other vehicles. How is New Glenn going to stand out? Well, a couple of ways. One very big way is the seven-meter-diameter payload fairing. It’s the largest payload fairing in the industry by far. That is, especially for certain missions, including LEO constellations, a big deal, because a lot of those missions end up being constrained more by volume than by mass. So, it’s a very large vehicle geometrically, and it’s also very large in terms of lifting payload: 45 metric tons to LEO, 13 metric tons to geosynchronous transfer orbit, which lets us take two heavy satellites on one mission. We’ll be very competitive on cost. That’s what we want to do. That’s the whole point of doing this. Another way that we are very different from anybody else out there in our approach to reusability is that we’re designing from the beginning for a very high mission life on that booster. That’s based on our experience with designing and operating the New Shepard vehicle. You have a vision of eventually millions of people living and working in space. So, there has to be more steps beyond New Glenn. What’s next?Yes, there are. I already talked a little bit about unleashing entrepreneurialism in space, and that is really critical. If you look even further beyond that, ask the big question: why we need to go to space? I think that is a very useful question to ponder. My answer is a little different from the answer that I think you hear sometimes more commonly. One thing that I find very unmotivating is the kind of Plan B argument: when Earth gets destroyed, you want to be somewhere else. That doesn’t work for me. We have sent robotic probes now to every place in the solar system, and this is the best one. It’s not close. My friends who want to move to Mars, I say, do me a favor and go live on the top of Mount Everest for a year first, and see if you like it, because it’s a garden paradise compared to Mars. So, we go to space to protect this planet. This is why the company’s named Blue Origin: blue planet, it’s where we’re from. But we also don’t want to face a civilization of stasis, and that is the real issue if we just stay on this planet. That’s the long-term issue. This planet is, actually, finite. If we take current baseline energy usage, globally, and compound it at just a few percent a year for just a few hundred years, you have to cover the entire surface of the Earth in solar cells. A life of stasis would be population control, combined with energy rationing. That is the stasis world that you live in if you stay. And even with improvements in efficiency, you’ll still have to ration energy. That, to me, doesn’t sound like a very exciting civilization for our grandchildren’s grandchildren to live in. And we don’t have to have that. The solar system can support a trillion humans. And then we’d have a thousand Mozarts, and a thousand Einsteins. Think how incredible and dynamic that civilization would be. But if we’re going to have that, we do have to go out into the solar system. We have to capture more of the sun’s output, and we have to use all of the resources that are out in space. And that’s very doable, but we have to get started. The fact of the matter is we don’t have forever. I don’t know all the future steps, but I know one of them: we need to build a low-cost, highly operable, reusable launch vehicle. No matter which path we take, it has to include that gate, and so that’s why that’s Blue Origin’s mission. And that’s a very expensive step, and that’s why Blue Origin is focused on that. It’s not something two kids in a dorm room are going to do. But I really want that dynamic life and civilization for our grandchildren’s grandchildren, so we’ve got to get started. After only three months of operation, NASA’s TESS (Transiting Exoplanet Survey Satellite) spacecraft is delivering on its mission to find more exoplanets. A new paper presents the latest finding: a sub-Neptune planet with a 36-day orbit around its star. This is the third confirmed exoplanet that TESS has found. The planet orbits a K-dwarf star about 52 light years away, in the constellation Reticulum. In astronomical terms, this makes the planet pretty close to us, and a great candidate for follow-up observations. Even better, it may have a sibling planet about the same size as Earth. The planet itself is called HD 21749b, and it’s about three times the size of Earth, and about 23 times the mass of Earth. This makes it a sub-Neptune, a planet somewhere between Earth and Neptune in size and mass. 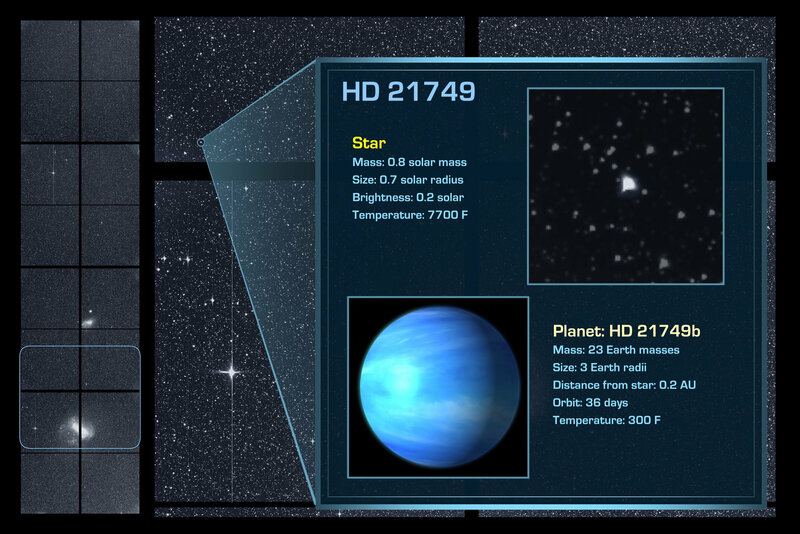 It’s star is a K-type star, or K-dwarf star, named HD 21749. The star is about 80% the mass of the Sun. “This planet has a greater density than Neptune, but it isn’t rocky. It could be a water planet or have some other type of substantial atmosphere,” explained Diana Dragomir, a Hubble Fellow at MKI and lead author of the paper describing the find. With a 36 day orbit, the new planet is close to its star, and its surface temperatures are expected to be around 150 degrees Celsius (300 degrees Fahrenheit). HD 21749b is the longest-period transiting planet within 100 light-years of the solar system. It also has the coolest surface temperature of a transiting exoplanet around a star brighter than 10th magnitude. The new planet is one of the three densest exoplanets with a mass above 15 Earth masses. The other two were found by Kepler, and are called Kepler 131b and K2 66b. Those two have densities that suggest rocky compositions, but they’re less massive than the new planet. But the density of the new planet, HD 21749b, suggest it has a substantial atmosphere. Scientists will be eager to do follow-up study on the new planet, especially of its atmosphere. The James Webb Space Telescope (JWST) would be used for that, once it’s in business. But according to the authors of the paper, “HD 21749b is not an ideal target for atmospheric characterization with the JWST,” because of the time it takes. But given the scarcity of this type of exoplanet, the necessary observing time with the JWST may be warranted. The discovery of more planets is always exciting. But in this case, the star it’s orbiting adds to the excitement. K-type stars like HD 21749 are very stable and long-lived stars. Their small masses give the stars extremely long life spans. They can stay on the main-sequence for between 15-70 billion years, giving life a long time to start and evolve, if conditions are right on any of the star’s planets. Our own Sun will only be stable for about 10 billion years, and half that time has already passed. K-type stars also emit less ultraviolet radiation than stars like our Sun. UV can damage DNA and hamper the development of life. They’re also more plentiful than stars like our Sun, so they’re key to the search for life. The system has another planet candidate, too. This one is Earth-sized, and if confirmed by follow-up observations, it would be the smallest planet found by TESS so far. The planet, called TOI 186.02 for now, is about 2.5 times the mass of Earth. Not much else is known about it yet. TESS is on a two-year mission to find exoplanets. It’s the successor to the successful Kepler mission. It will survey over 85% of the sky, and will look at 200,000 dwarf-type stars to search for exoplanets. When TESS finds a candidate exoplanet, follow-up observations by other telescopes will confirm its findings. The sub-Neptune world is the more interesting world than the so-called "earth-like" smaller one. Sub-Neptune sports about 300F degree estimated temperature (a rather hot water world; maybe even liquid water if under enough pressure). The smaller "earth-like" one estimated temp 800F. But imagine if the larger sub-Neptune has an approx. earth sized/massed large moon? Maybe at least 60-70% earth mass/surface gravity? The moon would orbit the larger planet, supposed it (the larger planet) blocks the sun enough for the moon to have much lower temperature? Imagine if it blocked the sun approx. 25%-30% of the time or some such? 300F = 422K. 422X(100-25)%=316K. 316K = 110F average moon temperature. Much hotter than earth but not unlivable; you would I assume establish your colonies in the extreme northern (or southern) latitudes presumably much balmier climate. Even if its host planet the sub-Neptune is tide-locked to its parent star the moon wouldn't be; it would likely have peculiar day/night cycles as it rotates on its own axis and also orbits its parent planet. Blackbody radiation scales with the 4th power of temperature. So a 30% reduction in incoming solar energy gives less than a 9% drop in temperature. On the other hand, if I've got my calculations right, a planet twice the distance from the star would have a roughly Earth like temperature. hanelyp wrote: Blackbody radiation scales with the 4th power of temperature. So a 30% reduction in incoming solar energy gives less than a 9% drop in temperature. Not sure I follow your calculations. Thought it was heat loss by radiation was proportional to the 4th power of the temperature difference. Hard to believe that say for instance a 90% reduction in solar energy received wouldn't reduce Temp by approx. as much but I am not a physicists. Also is a planet really analogous to a black body? What about heat loss by reflection, clouds and such? Last edited by williatw on Fri Apr 19, 2019 6:04 am, edited 1 time in total. hanelyp wrote: On the other hand, if I've got my calculations right, a planet twice the distance from the star would have a roughly Earth like temperature. My understanding is that the extrasolar "hot Jupiters" that is the gas giant like planet that gets so close to it parent star exists by first forming far from its sun (like Jupiter, Saturn, Uranus etc.) and then gradually absorbing what is left of the accretion disk. This absorbing causes the gas giant to drag, that is slow down in its orbit causing it to spiral inward toward its star. Finally stopping pretty close to its sun. That being said any original inward planets tend to get eject/pushed out of the way by the larger planet spiraling in. The only way for an earth like planet to be further out than the sub-Neptune world currently is it would have had to form later or further out; then spiral inward somehow. The surviving "earth like" world in this system probably was just lucky enough to be close enough that the sub Neptune stopped before it destroyed/ejected it. I would suppose moon(s) orbiting said sub Neptune would just be pulled in with its parent planet, surviving that way. I have noticed that when they talk about planets in the habitability zone of these stars they will talk about whether they are "earth like" that is approx. earth size/mass; or super-earths; or sub gas giants or gas giants etc. Never any discussion of large earth sized moons orbiting these larger bodies; as if they have chosen to ignore how common a large retinue of moons of various sizes is for the larger planets in our solar system. Ganymede is larger that the planet Mercury and nearly as large as Mars for instance. Likely that is the case in these extra-solar bodies. Not sure I follow your calculations. Thought it was heat loss by radiation was proportional to the 4th power of the temperature difference. Nope, blackbody radiation is proportional to the 4th power of absolute temperature. If a body at temperature X was inside a box of temperature Y, the body would radiate ~X^4, but also receive heat from the box ~Y^4. Also is a planet really analogous to a black body? What about heat loss by reflection, clouds and such? It's an imperfect model, but gets us in the right neighborhood. Reflection is only a factor if it varies by wavelength, or location around the planet. Atmospheric pressure is also a major factor, though some prominent forces are in DEEP denial of that.